Politicians, stop saying mass shootings are tragedies unless you’re going to do what literary critics do with tragedies: actually interpret them. Jeffrey R. Wilson is a faculty member in the Writing Program at Harvard University, where he teaches the Why Shakespeare? section of the university’s first-year writing course. Focused on intersections of Renaissance literature and modern sociology, his work has appeared in academic journals such as Shakespeare, Law and the Humanities, and Crime, Media, Culture, as well as public venues such as National Public Radio, The Chronicle of Higher Education, Academe, CounterPunch, and Shakespeare and Contemporary Theory. He is on Twitter @DrJeffreyWilson. 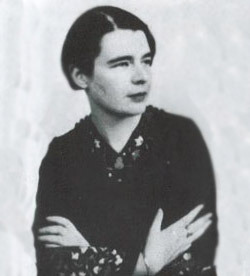 Marguerite Yourcenar's Coup de Grâce is a great World War I book. Except it isn't about World War I. It is a heart-wrenching love story. That alone would put it in the category of “good summer read.” It is a short book, clocking in at one hundred and fifty-one pages in my edition. It’s thus an easy book to stick into a beach bag or to carry on the train. It is also highly appropriate to read in the dying days of this summer, the summer of 2014. That’s because this summer is the hundred-year anniversary of the beginning of World War I. The guns started firing on June 28, 1914. By mid-August, young European men were dying by the tens of thousands, victims of a war that redefined organized, industrial killing for the modern age. The universal experience of a year spent eating. Something horrible happened. Horrible things happen all the time to everyone, but it’s still a shock how one phone call can obliterate your future and slam you into a dreadful present tense. I was taken in, I was cared for, and somehow I lost time — days. Vaguely I can recall moments where I wandered into my friend’s kitchen to make a cup of tea, only to find myself 20 minutes later in a puddle on her floor. Or I would wake up mid-panic attack, not quite sure where or when I was. 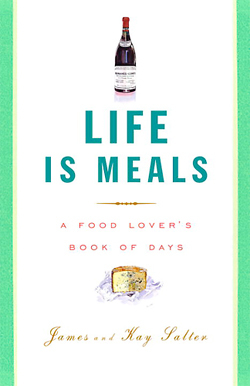 Life Is Meals by James and Kay Salter. 464 pages. Knopf. $22.50. Chicago was once full of killer broads. Part of Chicago froze in the 1930s. I’ve been thinking of my old home city of Chicago a lot lately, and of my new home in Berlin. The thread that ties them together seems to be that they’re both stuck in time. In the same time. They have one foot in this chaotic contemporary period, but the other is still in the 1920s and early ’30s, each summed up as a Bob Fosse experience (Chicago and Cabaret). 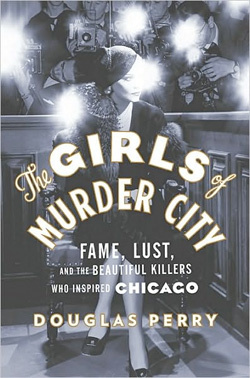 The Girls of Murder City: Fame, Lust, and the Beautiful Killers Who Inspired Chicago by Douglas Perry. 320 pages. Viking Adult. $25.95. Jean Carriès' "The Frog with Rabbit Ears." I came across the frog rabbit in the basement of the Petit Palais in Paris. 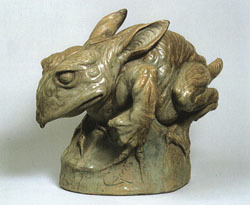 A medium-sized plaster sculpture, the frog rabbit is a hairless beast with a pointy reptilian nose, rabbit ears, long talon-like toes, and a stubby rabbit tail with no fur. He is a monster, though it is unclear whether he bodes something evil or merely something strange. It’s always tricky when poetry, current events, and politics intersect, but it happens all the time. Lawrence Ferlinghetti wrote “An Elegy to Dispel Gloom” after the assassinations of Harvey Milk and George Moscone. “New York American Spell” is Thomas Sleigh’s reaction to 9/11. I believe these poems achieve a sense of timelessness, but more on how to do that in a moment.